From Belgium to tropical Bahia, Brazil. « Historic beach house Salvador. 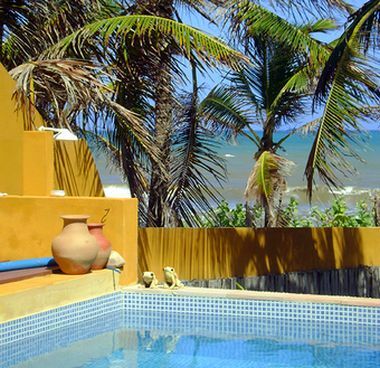 Pousada (B & B) Bela Bahia is our dream place on the beach where people can experience adventures and unwind in a mild tropical Bahia climate. Me, a Flemish woman who loves life on our tropical beach, together with my husband Marcio, a local fisherman here in Poças, Conde, Bahia. We enjoy to render our services to the visitors of our guesthouse and to make them acquaintance with this beautiful part of the world. 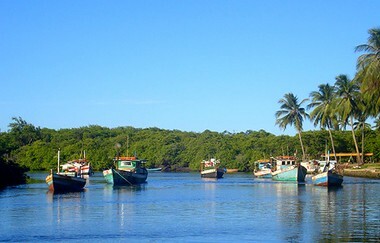 We have fun in giving abundant personal attention to the Bela Bahia lodgers. In a previous life I, Cristina, presented radio programs for Belgium’s Radio 2 and acted as commercial voice for the advertisement industry. Currently we run our enterprise since 2005. In addition to 3 comfortable guest rooms, a swimming pool and a tropical beach next door, we also offer day trips and complete package tour vacations. You can choose from existing packages, or compose your own package to tailor to your own preference. Day trip arrangements include a theme of your interest, e.g., sports, fishing, excursions etc. 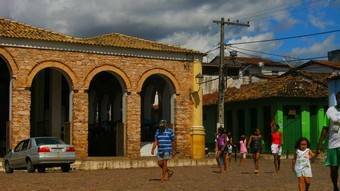 A package tour can range from a few days Aracajú town, a Salvador city tour, countryside sight seeing or hiking through famous Chapada Canyon. There are stunning Caves, Waterfalls and Rock formations in the Chapada Diamantina National Park, an international highly appreciated Eco paradise not far from Salvador de Bahia. Trips and package tours are each for groups of up to 4 persons with guidance in Dutch, French or English. This creates a relaxed atmosphere where everything happens at your own pace and for an unforgettable holiday! 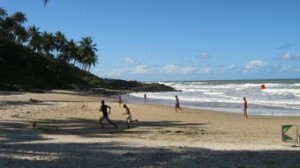 Our guests say: Going out with Cristina and Marcio is a marvelous way to really learn to know Bahia, Brazil. We felt at home, safe and understood, because they know the people and the area and speak the language. Not insignificant in a country where almost all people only speak Portuguese. Welcome to Bela Bahia, Poças, Brazil. 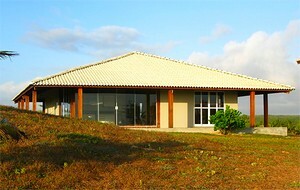 Visit our Bela Bahia website for more..